Cheesy Chili taste is fantastic! 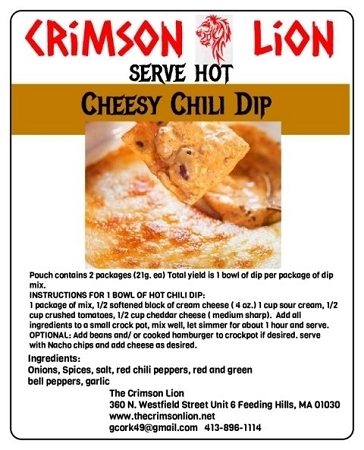 Cheesy Chili Hot Dip This warm dip mix makes a delicious tasting dip. Add in cream cheese and sour cream and either Monterey Jack cheese OR Cheddar cheese for a warm dip. Great with Nachos. Each pouch contains two dip mix packets and makes enough for 1 bowl of mix each packet. Use a crock pot for warming the mix.